Bora Bora is often labeled the perfect honeymoon spot for good reason. The turquoise waters, Tahitian flowers and overwater bungalows are just a few ingredients that add to the honeymoon in paradise. When you choose to honeymoon in Bora Bora, you can find endless choices and deals online or from your travel agent. Honeymoon packages can be all inclusive, or you can tailor them to your wants and needs. Expect perks like breakfast, use of kayaks, snorkeling gear and paddle boards, and even a chance to feed sting rays. Overwater bungalows are a popular choice and feature glass bottom coffee tables so you can gaze at the underwater life from the comfort of your room. Enjoy authentic Polynesian cuisine in a tropical dining atmosphere. Resort honeymoon packages also include such amenities as couple's massages, romantic sunset cruises where you have the opportunity to witness whales swimming close by your boat, and many other special touches throughout your stay. Some resort staff members will welcome you with flower leis upon arrival, and then send you off with a seashell necklace and a happy farewell wave upon departure. Bora Bora Honeymoon resort packages can be relatively expensive, depending on your wishes. 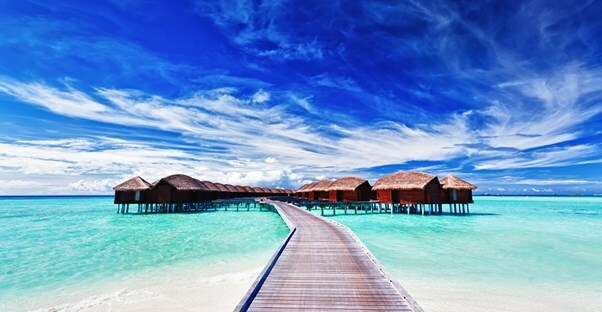 Overwater bungalows can range from $600 to $1,200 a night, while the beach and garden bungalows are much more reasonable. Since most of the resorts are three-star, the least you would probably pay is $5,000, including meals. Granted, you can add on all the extra perks you wish to make it the ultimate honeymoon, and some resorts will give you special deals for adding on all the extras. The breathtaking scenery and tropical landscape that greets you each day will definitely make it worth every penny. Some honeymoon guests prefer to enjoy more secluded surroundings away from the close-set water bungalows. Beach hotels offer more private surroundings, tennis courts, less crowded beaches and areas to just take a relaxing stroll. Wading in the reef pools can be rewarding with many different corals and fish calling it home. Blue Heaven Island is a secluded island that truly offers the honeymoon couple plenty of romantic alone time. Enjoy the beautiful coral garden, take advantage of the free kayaks, and partake in delicious island fare daily. An abundance of fresh fruit will greet you in the morning, and mouth watering seafood dishes in the evening. Rooms here are more reasonably priced at about $250 a night. Bora Bora honeymoons can offer you everything you want, and can be planned around your personal budget and desires. Planning your stay with meals included will certainly help cut down on your total bill. Staying in the most popular tourist resorts with all the perks will obviously be more expensive, but give you the total pampering you may be seeking on your special stay. With hundreds of options all around the tropical paradise of Bora Bora, you and your loved one are sure to find the perfect accommodations that will make your honeymoon the best time of your life.